My only experience with kabocha squash has been in tempura which I absolutely love. Last year during Vegan MOFO, Nicole at The French Fry Conundrum posted a recipe for Roasted Kabocha Squash Soup which I stashed away into my computer memory banks and along with so many other recipes, I never got back to trying it. Last week we bought a kabocha squash for Sushi Night with the hopes of using it for tempura. Well let’s just say we had too much on our plate or menu as it were and we opted to not use the kabocha. During the week I remembered Nicole’s recipe and decided that I was going to try it out. My intentions were to follow the recipe with a few exceptions based on what I had in the pantry, but in my normal fashion, I couldn’t. Not because the recipe needed changing, I simply have trouble following recipes. I was one of those kids that couldn’t color in the lines. 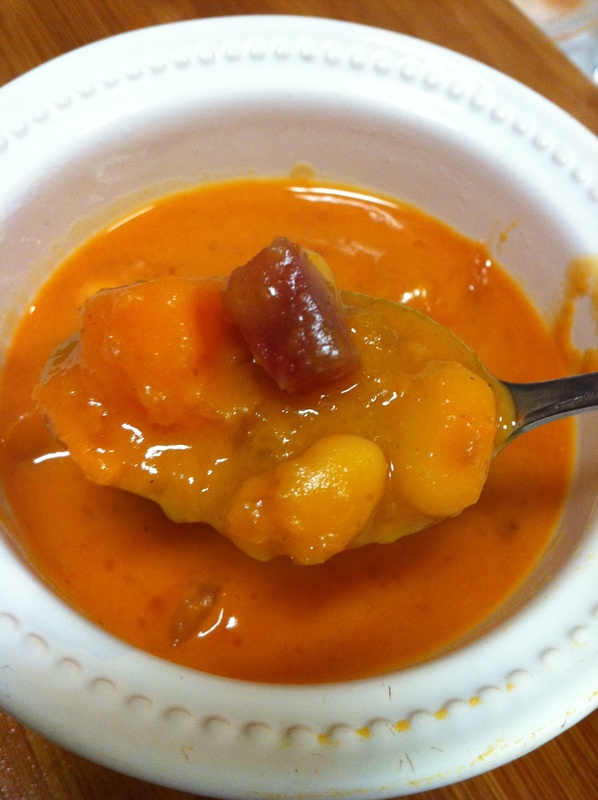 Well if you are considering making a kabocha soup/stew you now have two recipes to look at and create your own or decide if you are in the mood for creamy or chunky and follow the recipe of choice. Thanks again to Nicole for the inspiration! The ingredients for this recipe came to be because I needed to use the sweet potatoes and beet before they went bad. I had recently bought the great northern beans to try out and felt they would make a nice addition. I loved Nicole’s addition of ginger but was out so I opted for curry powder. Bake kabocha, sweet potato, and beet for 30 minutes. When they have cooled enough to handle remove the skins. Cut into bite size pieces. Set aside. In a soup pot saute onions in olive oil, salt, coriander and curry powder over medium heat. When onions have become translucent add squash, sweet potatoes, beets, water, bouillon, and coconut nectar. Bring to a boil. Once it reaches a boil remove one cup of squash, potatoes, and beets without liquid. Put the rest in a food processor and puree. Pour puree and 1 cup of reserved squash mix back into pot. Add coconut cream and beans. Bring back to boil, stirring occasionally. Add more water at this point if you want it thinner. Reduce heat and simmer for 20 minutes. Serve. Gallery | This entry was posted in An Ode to Vegan Bloggers MOFO 2012, Main Course, soup. Bookmark the permalink.